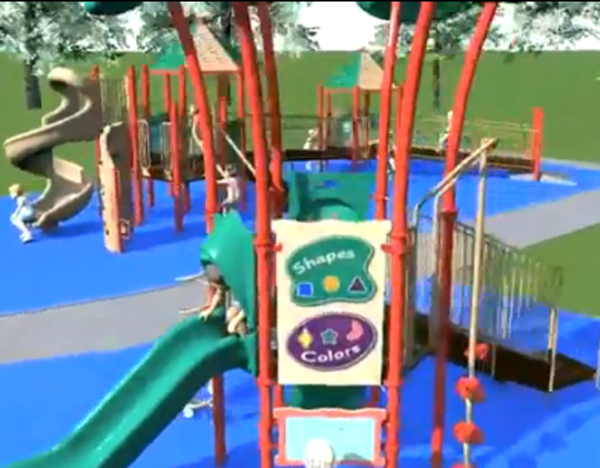 Fundraising begins in earnest this spring to build a playground at Eckhart Park. After soliciting ideas for a benefactor monument and producing a promotional video, volunteers have raised about $40,000 toward the $550,000 park project at 1330 W. Chicago Ave.
An Earth Day park cleanup will kick off fundraising, Nick Fotis of Friends of Eckhart Park told the East Village Association board Monday. Donors can text "Eckhart" to 40679 or schedule one-time or periodic contributions on Razoo, a Kickstarter-style website for nonprofits. Typically the Chicago Park District puts up about a third of the cost of such improvements, and $183,000 is budgeted in its 2014-17 capital improvement plan. The alderman matches it with discretionary capital, and Ald. Walter Burnett has pledged $175,000 in 27th Ward "menu money." The $40,000 represents 20% of the neighborhood contribution required for the project to move beyond site plans. Targets for the Eckhart Park steering committee (formerly the Eckhart Park Advisory Council) are $96,000 from face-to-face fundraising and $50,000 from social media. Thank-you gifts include T-shirts, books and an onsite benefactor listing. Gardening activities and a neighborhood walk are also planned. The West Town Chamber of Commerce will assist with publicity and Facebook ads, Fotis says. Iconic landscape architect Jens Jensen developed Eckhart Park in 1907, working as general superintendent of the West Park Commission under president Bernard A. Eckhart. Jensen was charged with completing Humboldt Park and building the West Side's first neighborhood parks. Jensen's plan for "Park No. 1" are on display in the Eckhart Park video, along with interviews from current and former neighbors and park supervisor Melody Mitchell.